While recent news of beheadings, mass murders and suicide bombings is difficult to escape, mankind is actually living in the safest time. 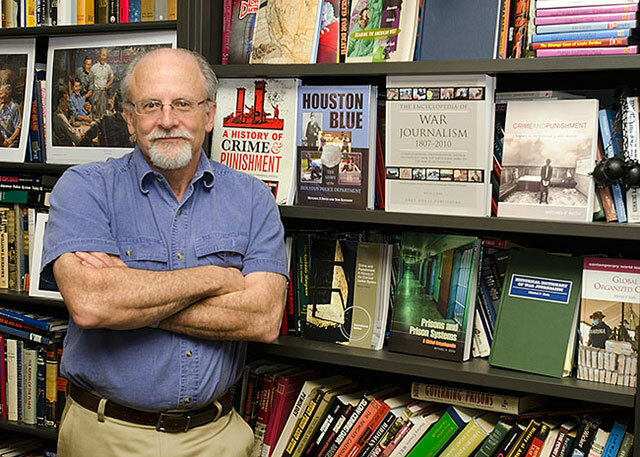 That’s according to Mitchel P. Roth, a criminal justice and criminology professor at Sam Houston State University, and he should know—he has spent hundreds of hours researching the subject for his most recent book, "An Eye For An Eye: A Global History Of Crime And Punishment." “What distinguishes this from other books that have been written on the history of crime and punishment is that my new book is the first one to look at the subject globally from a non-Western perspective,” he said. More information is available about Western crime and punishment, Roth says, not only because that is the time from which we have the first written records, but also because prior to European colonization there is little in the way of historical records from broad swathes of the world. Roth noted that even in the 21st century there are many countries that do not share information about crime and punishment. Going back thousands of years to crimes in cultures that existed before written law, Roth provides examples of justice served by the community before governments were formed. Roth also discusses how societies developed methods of punishment that were aligned with their cultural beliefs, such as the exhibitory public punishments in Asia. Roth’s book also chronicles the transformation of punishment and the development of the modern penitentiary. His research shows that as governments became more centrally established and countries adopted the prison system, there was a tendency to move beyond public capital and corporal punishment. “During the time of the Bloody Code of England, approximately 200 to 300 offenses carried the death penalty. As the justice system evolved in England, rather than sentence so many to death, the courts began using transportation to the New World and Australia as an alternative means of punishment,” he said. “The whole idea of the progression of the justice system is not to punish harsher, but to punish better,” he said. In fact, most forms of execution have become more humane over the last few hundred years. “From the Athenian use of the poison hemlock and simple beheading, to the technological marvels of the guillotine, the electric chair, and gas chamber, and now lethal injection, penal reformers have played an important role in determining how we execute the supposedly worst among us,” he said. Other constants include the fact that perpetrators of crime, particularly violent crime, have overwhelmingly been young males over the centuries, and the most severe punishments were directed at them as well. Roth also discusses the role of colonialism and how it shaped different types of punishment throughout the world, the rise of the penitentiary, organized crime and the globalization of criminality. He also devotes one chapter to murder. “Murder is probably the one crime most written about and the least likely to happen in your lifetime,” he said. “But the way we kill each other and murder rates tell us a lot about a culture. Murder is a social relationship—two people interacting, even if it’s just for a moment. “I also discuss serial homicide and mass murder, because that seems to be where all the fascination is, although it is extremely rare, he said. Roth admits that the book won’t be everyone’s “cup of tea,” because of its gruesome and gory details. However, the book should appeal to those interested in criminology, the justice system, sociology and history. “Despite amazing advances on every level of the human experience, there is a remarkable continuity in what crimes are committed as well as the sanctions used to punish them,” he said. “Although the means for committing crimes are quite different in the digital, post-industrial world, the goals and motivations of criminals and criminal justice systems have not strayed too far from their antecedents. “Ultimately, ‘An Eye for an Eye’ demonstrates that the history of crime and punishment remains an inconsistent chronicle of experimentation—borrowing, adapting and finding new alternatives—often finding penal officials going back to history books to retool ancient sanctions for a new world,” he said. 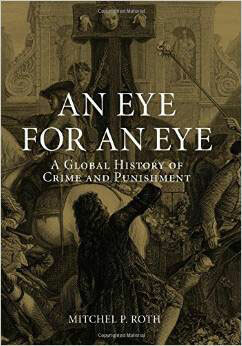 "An Eye for an Eye: A Global History of Crime and Punishment" is published by Reaktion Books in the United Kingdom and distributed by the University of Chicago Press in the United States. It is available through both publishing houses and from booksellers online, such as Amazon. A review of the book by former Los Angeles County District Attorney Gil Garcetti was recently published in the Feb. 8 Los Angeles Review of Books. Roth has just completed another book, "Convict Cowboys: The Untold History of the Texas Prison Rodeo, The Wildest Show on Earth," which he expects will be published sometime during the next year.